The bus stop near Fred Meyer Monday evening: No bench and no squatters. The Albany City Council Monday reviewed the draft of an ordinance that it likely will enact on Wednesday night. 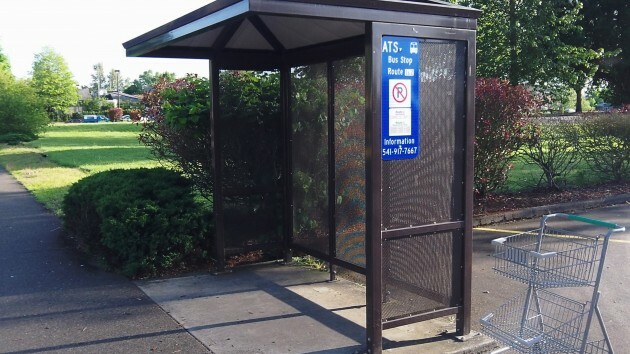 The new law will say that no one can enter or be within 20 feet of a transit shelter unless waiting to catch a bus. It has a similar provision for Albany Station, the train depot. One obvious concern, mentioned by Councilor Floyd Collins, is that this law will make it illegal to wait at the station to pick somebody up. City Attorney Jim Delapoer, his assistant Sean Kidd and police Lt. Casey Dorland responded that while various innocuous actions might be made apparently unlawful, no reasonable officer or prosecutor would go after anyone for those things. Instead, this kind of law is the only possible answer to chasing away or citing people whose long-term presence or habits make bus shelters and the train station unpleasant or even impossible for the public to use. “Right now the bad guys are winning,” Delapoer said. He said that people who depend on the transit system and often have to wait long periods for the next bus need the protection of this measure. ….” But city officials say they would never prosecute anyone merely for getting out of the rain.”…. How do they determine if someone is merely getting out of the rain? By the way they dress? I’m sure I’m often mistaken for homeless, especially when riding my bicycle. There is abuse of these stops, where a bus is making a needless stop because someone (non rider) will be using the bench. Maybe the city should install benches 21 feet away from the bus shelters for these people? How about cameras on the bus? Take a picture of “non riders” that cause a needless stop for the bus. 2nd offense and the picture & location is sent to the police? I’d just hate to see an elderly person, or one with a medical condition such as emphysema be ticketed because they had to stop & rest for a few minutes. “Innocuous” laws have a way of growing when convenient for the “authorities”.